Offering rooms with free WiFi, and a rooftop terrace with views of the sea, El Greco Studios are set in a traditional 15th century building just 150 metres from Skala�s port and Patmos Town. Offering panoramic views to the northerrn Patmos and the Aegean Sea, 9 Muses Exclusive Apartments is situated 4 km from Skala Port. Cold and warm dishes are served next to the floodlit pool throughout the day. 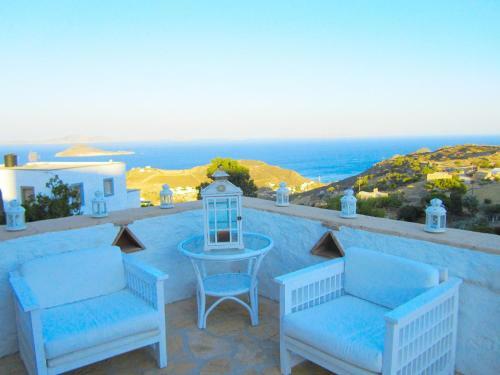 Featuring a garden, sun terrace and WiFi in public areas, beachfront Villas in Patmos is located in P�tmos. It is 2 km from Skala Patmou and its port. Monastery of Saint John the Theologian is 4 km away. Peacefully located on the road leading to the famous Monastery of St. John, the traditionally decorated Artemis Villa offers 6 stone-paved verandas and patios overlooking the Aegean Sea and the island.